The Reverend Rees’s latest deranged ROAD UPGRADE PLAN, rolled out to a disbelieving public by his new cabinet transport supremo, The Former Socialist known as Kye Dudd, are some so-called “improvements” to the A4018 in North Bristol. The road connects Cribbs Causeway and Filton to the Centre via Westbury-on-Trym and will become an important road link from the south and west of the city for the Reverend’s corporate friend’s FILTON SHED arena. To accommodate large traffic flows to and from the proposed venue’s huge car park, The Former Socialist Known as Dudd is proposing to virtually SHUT Westbury-on-Trym to cars altogether while creating a MAZE of no left and right hand turns along the length of the A4018. 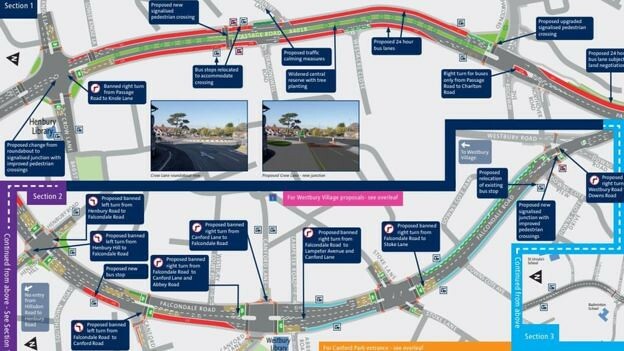 Much of the road will also be NARROWED to make way for 24 hours bus lanes and the usual ragbag of non user-friendly, deeply unpopular shared use cycle schemes. While these improvements might be a small benefit for through traffic and First buses heading to the Reverend’s corporate shed and the M5 from the centre, they will be a NIGHTMARE for local traffic, residents and businesses. Residents, who are actual council tax payers, have pointed out that getting to their homes from this ‘improved’ A4018 will involve LONG and TORTUOUS journeys puffing out extra vehicle pollution into their neighbourhoods and children’s lungs. Quiet residential streets will be transformed into BUSY RAT RUNS as locals endeavour to negotiate the council-designed maze to get to places such as Brentry and Henbury. Neighbourhoods that Dudd intends to DEPRIVE of direct access to the A4018 to facilitate faster through traffic to the Filton shed and the M5. Meanwhile, businesses in Westbury-on-Trym predict the DEATH of the village once traffic is BANNED and customers from further afield abandon the shops there. The council has held a number of consultations on the plans in the area that have variously been described as “a farce”; “a fiasco”; “a shambles”; “pointless” and much else besides. One reader describes a visit to Westbury Library where after a long wait he got to speak to a council officer “STRAIGHT OUT OF SCHOOL“. “How long have you lived here?” he enquired. “Nearly a year… I’m from the region though,” came the reply. This entry was posted in News and tagged A4018, Brentry, Filton Arena, Filton Cribbs Causeway, Henbury, Kye Dudd, M4, Westbury-on-Trym on April 6, 2019 by thebristolblogger.